Truly a fallen kingdom when a volcano is about to take a whole island of dinosaurs out of existence, again. Can Peter Quill, I mean Owen Grady save them? That's for you to witness yourself! Cast: Chris Pratt, Bryce Dallas Howard, Rafe Spall, Justice Smith, Daniella Pineda, James Cromwell, Toby Jones, Ted Levine, Jeff Goldblum, BD Wong, Isabella Sermon, Geraldine Chaplin. Pros: I love the dinosaurs and seeing them again is always a plus. We get to see how Blue and the rest of the raptors got to respect Owen when they were growing up, and seeing him as their "mom" made me want to have raptor like blue if I'm being honest. 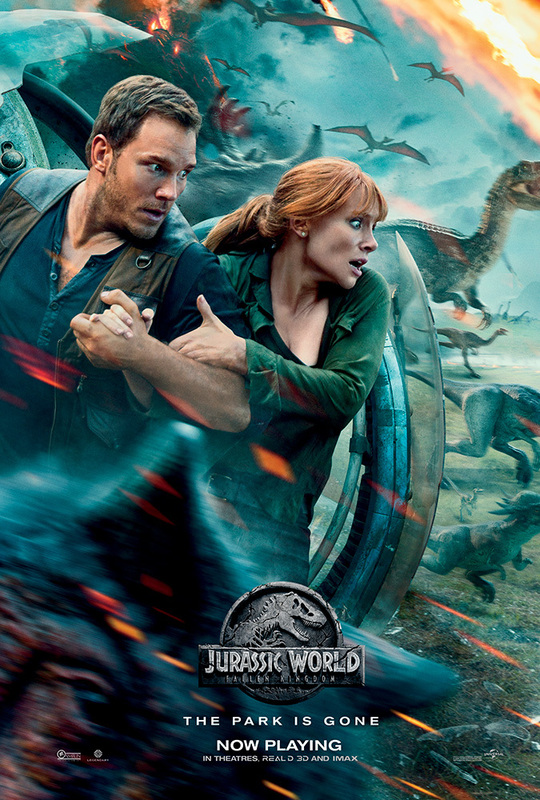 Chris Pratt and Bryce Dallas Howard's chemistry on screen is very astounding and if they end up doing a third adaptation or any other movie I'd love to see these two cast together. Story took a surprise turn half way through the movie and I didn't expect that, it kept the movie rolling and I enjoyed it. Throughout the film you get to see two sides of emotions about saving the dinosaurs or letting them die, and although both sides had valid points, it was nice pondering as I sat there watching the movie what side I would take. Cons: We don't see much of the island a whole lot and that bummed me out, which I wished most of the movie was on the island, but the direction they took made sense. Jeff Goldblum makes his grand appearance but don't expect many scenes with him, it was probably like three minutes or less, what a waste of even bringing him back in my opinion. Seeing Dinosaurs on the big screen is always a plus which in turn make you feel emotions for them, even those carnivorous types made it a little more special. You'll have fun watching this movie full of adventure! It's been 14 long years for an Incredibles sequel to finally emerge but what a great flick it turned out to be! Cast: Craig T. Nelson, Holly Hunter, Sarah Vowell, Huck Milner, Catherine Keener, Eli Fucile, Bob Odenkirk, Samuel L. Jackson, Michael Bird, Sophia Bush, Brad Bird, Phil LaMarr. Pros: We dive into the family we all know and love and get to know each one on a personal level. Bob is stuck being a stay at home dad while Helen is out trying to show the world supers can become legal again by setting a good example, and this is when the comedy comes into play. Bob soon realizes taking care of three kids is really hard work especially with Jack Jack's budding powers. Jack Jack stole the show in every scene he was in, not only do you get to see more powers than he showed in the first film, you will be surprised at how overpowered he becomes. Frozone had a bigger role to play this time around and that was great, he was always one of my faves. 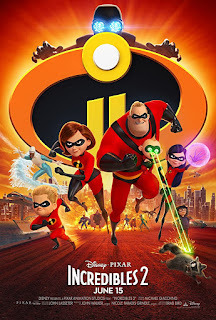 The story never stopped moving along, it would go from the comedy of Violet being a teenager, to solving math problems with Dash, to the serious side of Elastigirl fighting crime. Incredibles 2 never faltered. I really liked the message about family, even at tough moments, is always there to help out. Cons: I personally thought the villain in the first was better than the Incredibles 2 villain. You might have a different opinion so let me know what your thoughts are in the comments! It was predictable who the bad guy was going to be and although that didn't bother me in the slightest I think it would have been more shocking if it was someone else entirely. I want more story out of this family -- hopefully, there is an Incredibles 3 in the works! When the whole theatre cheers for a movie before and after, you know it was a long wait coming. It was one of those moments that reminds me of a Marvel movie when it happens there too. Incredibles 2 was very entertaining from beginning to end. There is also a short film before the actual film begins and don't worry it is not even as close to bad as that Frozen short before Coco. It actually portrays the topic of family as well. 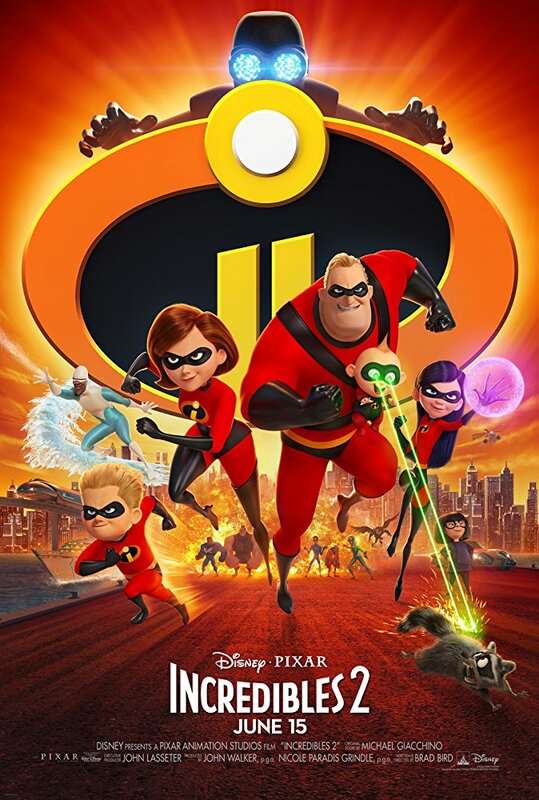 Go enjoy Incredibles 2 with a date or family, you won't be disappointed.